The Aft Magazine Section model will make for an interesting conversation piece in any model collection. Most models we see are of the exterior of a ship. It is not often we get to see the detailed view of the inside. The ammunitions or powder magazine is by far one of the most important compartments on any ship of war. It contained all the explosives required for the guns. To protect the powder from enemy fire it was generally located below the waterline of the ship which in turn presented its own set of problems in preserving the integrity of the gun powder. Depending on the size of the ship it was not uncommon for ships to have more than one magzine. The USS Constitution for example has one fore and aft. In total there are six sheets of drawings containing all the information you need in order to build the model. If you have any questions be sure to post them here in forum area of the site. 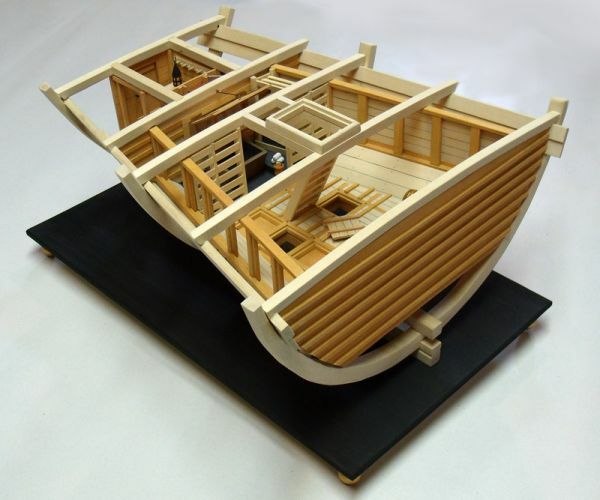 You can also check our Jeff's build log of the Aft Magazine Section Model in the Fourm area. These plans are available in digital format only (PDF). Plans are formatted on 34" x 22" sheets. To help cover the costs of upkeeping the site they are being made available to anyone making a donation to the site of $20.00 or more. So if you wish to acquire this set of plans click on the Donate button on the left of this or on any page on the site it appears. Be sure to provide your email address in the comments field when you make your donation, or contact me directly. Once confirmed, I will email them to you directly.